August 1st marks the celebration of Llamas or Lughnasad, the mid summer celebration of the first harvest of the season. For ancient Celts, this was a time of celebration and honoring the sun and the sun god, Lugh. Across the Americas, people of many traditions celebrate the summer through Ceremony, Church retreats, Spiritual Gatherings, and trips to the beach. The summer is a time of gathering and a time of celebration as the days are long, travel into the high country becomes possible, and many plants are harvested for medicine. The energy of this time of midsummer is potent for all kinds of spiritual work. The sun continues to shine down and here in California, many medicinal roots call for harvest. 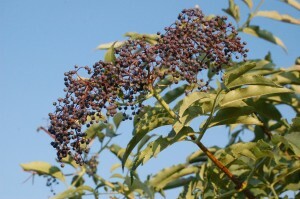 One of my favorite plants to work with in the mid-summer is Elderberry. Here in the bay area the flowers of this tree have gone to fruit and blue jays abound munching on the sweet berries of this tree. 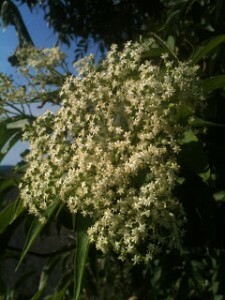 The Elder has been revered as a sacred plant for the peoples it grows near for millennia. This is a tree that has made it way into the written and oral traditions of most of the peoples where it grows. There is much lore about magical uses of this plant. From protection to healing, the medicine of this plant has been recognized for thousands of years. There are stories about the ill fate of those who cut down this tree and stories about the protective power of an Elder tree growing outside your home. This tree has been woven into Christian mythology as it is said that the cross on which Jesus was crucified was made of an elder tree. Many ascribe this connection as the reason that ill was brought upon those who cut down this tree. I suspect that there is a good chance that the importance of this tree in indigenous European healing and spiritual traditions is the root of the belief that this tree was made into the cross on which Jesus hung. Earliest accounts of this mythology date back to the 14th century so it would make sense that Christianity would appropriate this powerful plant ally into it’s mythology and tradition as it spread across Europe. The tree was familiar as many of the plants were down there, but I couldn’t place where and how I knew it on the land I called home so many miles away. His mother smiled as he eagerly told me the story of when he was a small boy and very sick with a fever. His mother made him tea with the flowers and this was what finally broke his fever. His eyes were full of joy and love for this tree as he told me the story. I was struck by the reverence with which this child spoke of this healing tree. He told me proudly that his ancestors have used this trees medicine for many many years. Elder berries are just delicious and the flowers are potent medicine as well. I love to use the berries as an anti-viral when colds are around or just beginning to show symptoms. I also use the berries in my “immune boosting tonic” that many people take a small amount of daily to prevent catching colds in the fall and winter. The Elder is a gentle and powerful plant that is safe to take in small doses daily over a period of time and works wonders in keeping us healthy through the seasons. When I learned that historians cite Hippocraties as calling the Elder his “medicine chest”, I wasn’t at all surprised because this tree has so many powerful healing properties. Like all plants, but with especially this potent teacher it’s important to make good offerings if you are going to harvest any of this tree for medicine. Make sure the tree hasn’t already been harvested from if you are going to collect some berries or flowers from this tree. Approach the tree slowly and sit with it for a while before you do any collecting. Ask the tree permission to harvest and listen–don’t just automatically hear a yes. The tree may say no. As with all harvesting, always be open to hearing a no. If you do receive a yes, ask the tree what kind of offerings it would like. I have found that this tree often appreciates offerings of milk, tobacco, gummi bears, shiny things, songs and prayer. If you’re a Christian, I would encourage you to pray in Jesus’s name with this tree as humans have prayed with this plant in a Christian context for a long time. If you are not Christian, I encourage you to pray with this tree in a way that feels in alignment with this wise plant and your spirit guides. 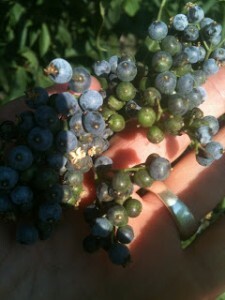 An important thing to note in harvesting this plant, is the ripeness of the berries. If you don’t harvest the berries at the right time you are likely to get sick. 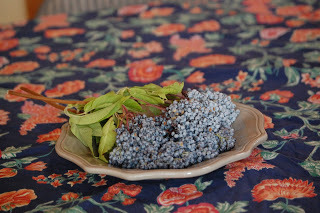 Unripe Elderberries can induce vomiting and pretty awful stomach upset, so please make sure the berries are a dark blue/purple when you harvest. If they are at all green you want to wait a little while before harvesting. You can see the unripe berries in the picture to the left. This is another reason that asking permission is so important when harvesting this tree. I have found that when I have heard a “no” when asking permission, upon closer examination, the berries are not quite ripe yet. So don’t forget to sit with the plant and listen before you harvest.